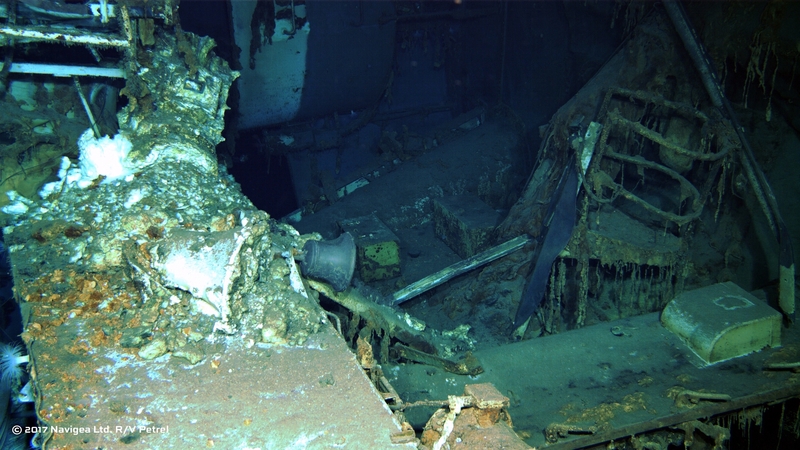 Seventy-two years after it disappeared into the black depths of the Philippine Sea, the heavy cruiser USS Indianapolis (CA-35) reappeared in bluish-green images captured by a deep-sea drone and aired live during a Wednesday PBS broadcast special. 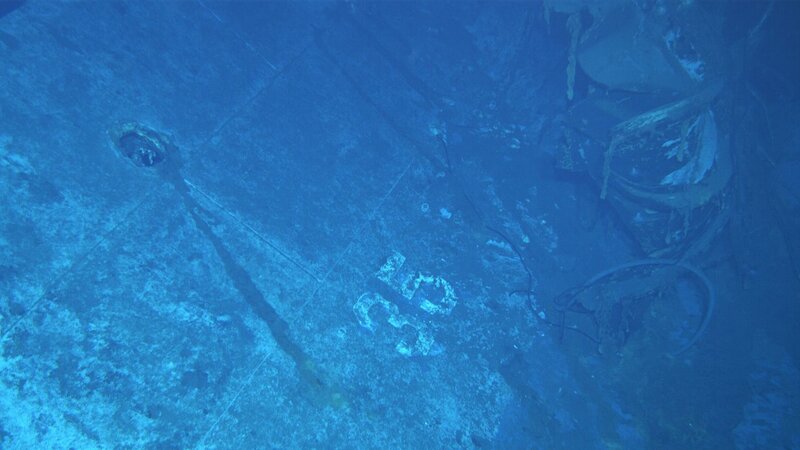 Viewers could see the ship’s hull number, “35,” clear in the high-definition images relayed in a live, hour-long broadcast from the research vessel Petrel operating in the Philippine Sea that aired on PBS stations. The research ship hovered above the ocean floor where the damaged Indianapolis rested, at 18,000 feet deep, partially buried on its port side in a large crater, near several smaller debris fields. Cameras on a remotely-operated vehicle operated by an expedition crew relayed images of Indianapolis, its heavy firepower still on watch as it was before two Japanese torpedoes sent the ship to the depths of the sea. The No. 3 gun, still in place despite a buckling deck, and a 40mm anti-aircraft gun, whose 11-member crew included eight men just to feed its foot-long shells, remained locked and loaded. An aft five-inch gun, rifling marks clearly visible in the barrel. One of the 1,200-lb. torpedoes had struck the ship near the bow, breaking it off as the ship sunk deep into the ocean. The second torpedo struck near crew berthing, about midship and into the lower decks. Images from the starboard side showed just what might be a fraction of the damage, the expedition leader said. 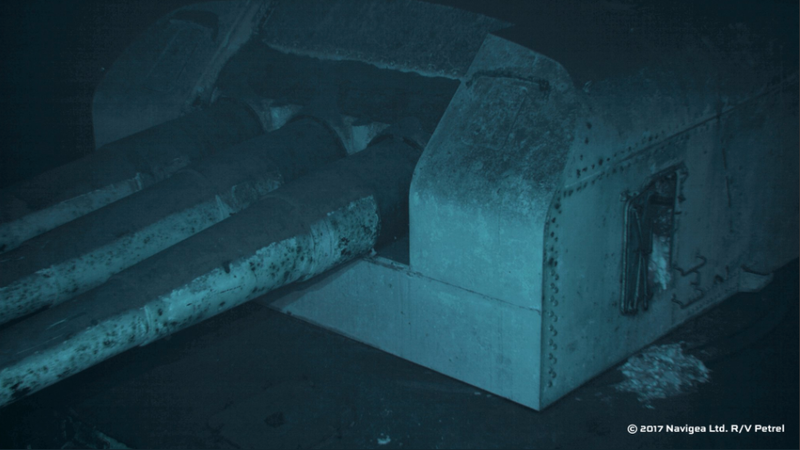 The ROV’s lights also revealed Indianapolis’ small, starboard hangar bay but also a piece of the starboard side half-peeled up above the silty ocean floor. On nearby debris field rested a torn airplane wing, its blue-and-white star and stripe still clearly visible. Another piece of debris showed victory images of a black airplane silhouette and red marks depicting Japan’s rising sun. 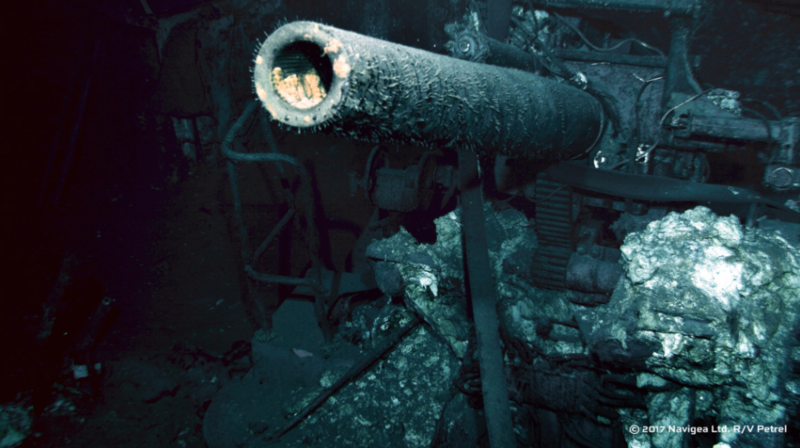 “The hull the structure is uniquely intact and its well preserved,” expedition director Rob Kraft, aboard Petrel in the Philippine Sea, told viewers. “It’s unbelievable the condition,” he added, describing strikingly sharp images streaming live from the ROV and pictures taken from HD cameras and 3-D images captured by high-tech sonar during the last three weeks as the expedition surveyed and scanned the area. Other images revealed haunting signs of life that once was. An open hatch near the skipper’s cabin. The ship’s bell. Teak decking. Among the scattered debris shown sitting on the ocean floor: A toolbox. A white bowl. A ship’s crane, slightly damaged. A first-aid kit, its red cross clearly marked. For more than 70 years, the location of the Indianapolis had remained a mystery. Its final resting place had become almost publicly forgotten amid national grief of the loss of nearly 800 men just days before the end of World War II – many who drowned or were eaten by sharks – and controversy over the Navy’s subsequent court-martialing of the ship’s skipper for hazarding a ship. “There’s damn few days when I don’t think about …some part of the story,” Thelen said in segment aired during the broadcast. He’s one of only 19 living crewmembers who survived the sinking. When it was last spotted, the Indy was cruising on a westerly course from Tinian to the Philippines, after the secret mission of delivering components of the atomic bomb dropped on Hiroshima a week later. Past efforts and expeditions to find the ship had come up empty until last year. Richard Hulver, a Naval History and Heritage Command researcher, had located a log entry from an amphibious landing ship – LST-779 – that had crossed paths with the heavy cruiser just 11 hours before the ill-fated torpedo attack. That helped narrow down the location and time of the sinking of the Indianapolis by the Japanese submarine I-58 on July 30, 1945. Last month, an expedition led by Microsoft co-founder and philanthropist Paul G. Allen and NHHC researchers found the wreckage in the Philippine Sea. Allen announced the finding in an Aug. 19 tweet. Indy‘s bow lay about a mile from the bulk of the ship. Its bridge rested in another location. Nearly 300 sailors of the crew of 1,196 might have gone down with the ship, killed by the torpedo explosions. About 880 sailors and Marines survived the attack and subsequent sinking, but the Indianapolis wasn’t reported missing for several days. For nearly five days, they suffered in the sea’s heavy swells, under the unrelenting sun, suffering from dehydration, drinking salt water, drowning and shark attacks. Only 316 survived the oil-stained seas to see rescue by Navy forces. “It would be easier to die out there than to stay alive,” Thelen recalled. Kraft didn’t disclose the location. The Navy won’t reveal the site coordinates to protect it since the wreckage is considered an underwater memorial. “It is hallowed ground and it is being treated as such,” said Bill Toti, the former commanding officer of the submarine USS Indianapolis (SSN-697) said during the broadcast. While the ROVs have captured camera and video images of the wreckage and mapped the area with sonar, the expedition has not disturbed the site and no artifacts will be collected. Nor will the remote vehicles enter the wreckage of the ship. “So you must treat them with he utmost respect,” said Scott Matthews, an ROV pilot. At the deep, dark depth, Indianapolis today is host to corals and other sea life, some which give gun turrets a crusty coating. At the No. 3 gun, aluminum-eating bacteria whose waste creates rusticles pour out of four-foot hatch. The Indy’s discovery may provide closure to some survivors and relatives, as well as to the Navy. Interestingly, in what Toti calls “an unbelievable coincidence,” a Japanese expedition crew “just in the last few weeks” located the wreckage of I-58, which continued attacks on the U.S. fleet in the war’s final days. The U.S. Navy had scuttled the submarine in 1946.